The 3.0 version of the NeoRecruit Latest Offers module is now available. 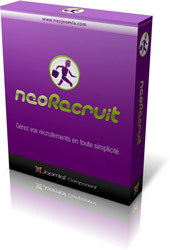 It has been developped to make the module totally compatible with NeoRecruit 3.0, for Joomla! 1.6, 1.7 and 2.5. Remember, this plug-in can display the latest job ads that have been published in the component NeoRecruit on any page of your website. You can parameter the informations which will appear in the module (ads title, category, required studies, type of contract, etc), and also choose between several displaying ways (table or automatic scrolling). To finish with, since the plug-in has been rewritten according to Joomla!s standards, you can also personalize as much as you like the HTML code of the module, by overloading its template.